Our baby is almost a year old!!! Can you believe it? Cause it feels as if it was seriously just weeks ago. I look at her and see how fast time has gone. She’s such a treasure. This time around, being the second child, I realize how much easier it was to take care of her. I don’t know why. And by God’s grace, taking care of two wasn’t a burden. It had its challenging moments, I readily admit, but I see so much more of who Emma is, as the older sister, and I realize how much more Zi’s life is enriched because of her. Emma had our full attention, but Zi gets the love, energy, and playful attention of her older sister. Sometimes I just sit back quietly so I can watch them interact with each other. You should see the down time moments when Zi is resting and Em lies down with her; Zi will brush her fingers on Em’s cheek just to know she’s there. 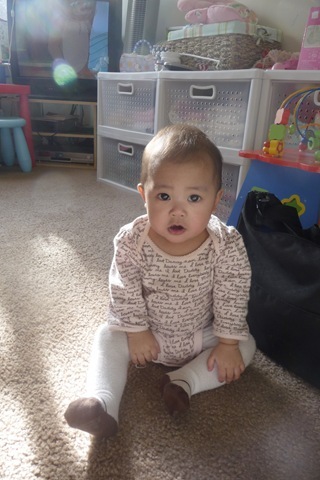 At eight months, Zi stood up independently for the first time. She also uses things to get to standing position and lets go, to test her balance. She’ll stand for a good 10-15 seconds then let go because she doesn’t know how to take the next step. She does this a lot, so hopefully by this month, she’ll take her first step. She crawls so fast! hahahaha…it’s textbook crawling. I always mention how she looks like a doll because her body is small and doll like. She can drink from a sippy cup and even tries to drink from a baby cup. We’re teaching her how to do both. She’s still on gerbers, but we’ve introduced her to real fruit like bananas, apricots, apples. She’s also had rice porridge. She can say Mamam, Dada, and Ate. And I know she knows what they mean because she’ll say them at its appropriate times. She loves music. To add to her penchant for singing, when listening to a good song, she’ll sway back and forth. She also smile and wave hello to people when she first sees them. She can press buttons on her toy house to make sounds. She rings the doorbell and presses on the radio buttons. She taps on things to drum on them. She can also put small food items in her mouth. Read her 7 month here.